It’s been a while since you had to call the guy you use in Chicago for removal services. It’s Friday afternoon, and you get a call that says one of the families you serve is looking to retrieve a loved one to come home for their celebration of life. That loved one was visiting relatives in Chicago when the unexpected event took place, and now the family is turning to you to get the remains of their loved one home safe. You do what you’ve always done. You call your guy. Only this time someone else answers. The guy you always used retired, and his business is now a pet store. Panic sets in. Where are you going to find someone to perform this service on a Friday afternoon? Fortunately, that’s why NMS is here—we have the people you need where you need them, allowing you to handle any unexpected circumstance! But there are some ways you can help avoid the panic before it sets in with contingency planning. The more hats your team members can wear, the better. Make sure that your staff can maintain functionality if you or one of your other leaders is gone for an extended period. The better prepared your team is to handle different responsibilities the better you will sleep at night, knowing that your business is in good hands. What happens when the team you use for removal or embalming goes out of business? What happens when the local company you use can’t handle your order in a timely fashion? You must be prepared. Remain loyal to the business you have relied on in the past. But always have an option ready in case things change. What would you do if a natural disaster or, God forbid, a mass killing happened in your area? Could your funeral home handle that demand? Do you have space and resources available to handle multiple bodies and preparation necessary to handle such a crisis? 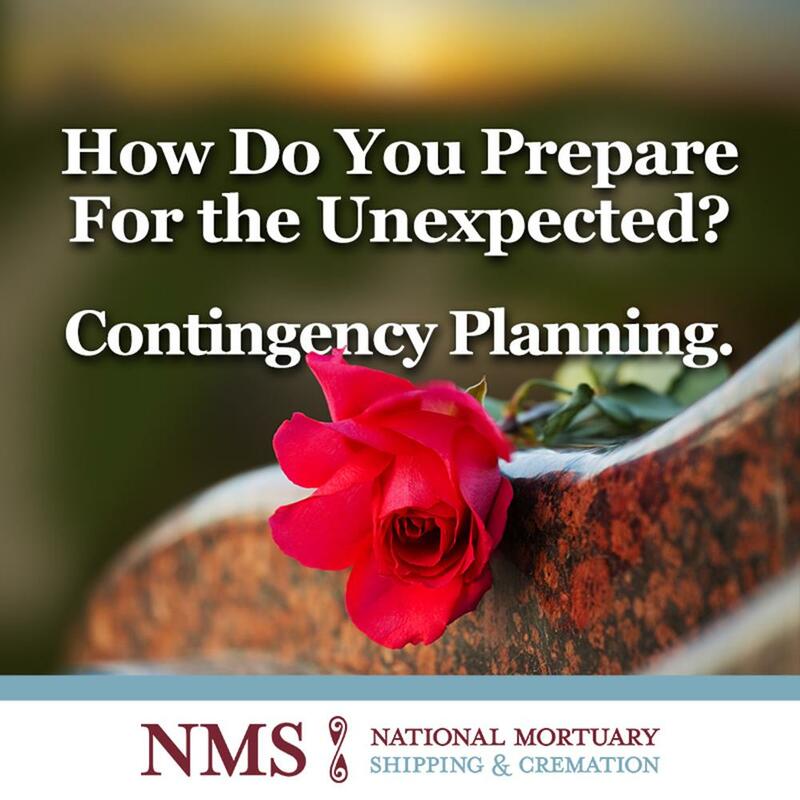 Work to develop contingency plans for how your team would handle certain scenarios, so you aren’t left scrambling like other funeral homes in the area if a disaster or tragic event occurs. Situations like the ones discussed in this article are exactly why National Mortuary Shipping & Cremation exists. From our international network of suppliers and service providers to our 24/7 death call app, we are here to ensure that when you call with a crisis, we can help you achieve the results you need to take care of the families that are relying on you. Contact NMS today to find out how we can help fill in the gaps in your contingency plan.